Cabeau, a leader in comfort travel products available in more than 110 countries, will exhibit at the TFWA World Exhibition and Conference (Yellow Village, E39) in Cannes between September 30 and October 5, 2018. The category leader will showcase its acclaimed Evolution® S3™ pillow, which was recently selected as the best travel accessory in the first ever consumer-voted Travel Retail Awards. Cabeau recorded a very healthy growth in the first half of 2018 in the travel retail space, mainly due to its expansion into cruise ships and a new global contract with Lagardère. The introduction of the Evolution® S3™ pillow also played an important part in the company’s growth trajectory, and with the announcement that Cabeau will be showcasing the pillow in Cannes, it is on track for a record year. “We’ve experienced monumental growth this year. Exporing new channels, creating new products and signing global partnerships is the right path for us to follow to ensure we fortify our position as a world leader in comfortable travel products,” said David Sternlight, Founder and CEO of Cabeau . “We strive to stay one step ahead of our competitiors, and the launch of our Evolution® S3™ pillow earlier this year strengthened both our portfolio as well as reputation as a company which delivers on travel made better.” The state-of-art Evolution® S3™ pillow combines Cabeau's patented ergonomic design with high technology features and fabrics and presents an innovative, patent-pending “seat strap system” (S3) which keeps one's head from falling forward or sideways by attaching to the airline seat and enhances travellers’ comfort level. Cabeau aspires to make travel better and have its customers travel as comfortably as possible. The company listens to its customers and uses their feedback to create products which will server their needs the best. According to research, 77% of travellers reported neck pain during a flight and 72% of frequent fliers indicated difficulty staying asleep. These findings illuminated a need for better head and neck support, a factor accomplished by the introduction of the revolutionary head-rest wings on Evolution® S3™ . 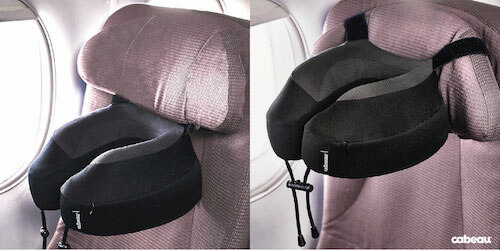 Every part of the pillow was engineered to provide the best possible experience for a traveller. The Evolution® S3™ pillow introduces an ultra-soft solution to in-flight sleep comfort. For more information about Cabeau, please visit www.Cabeau.com.